An oriel window is a window that projects out from a building. It does not reach to the ground, so it is cantilevered from the building. Often oriel windows are single windows, but they can be a bank of windows, as with a bay window. 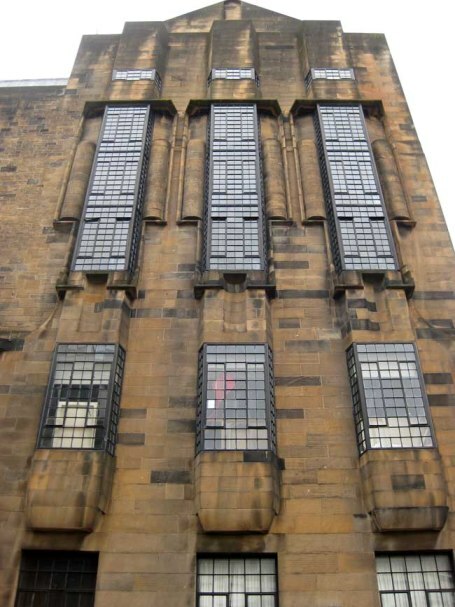 In the example below a multi-storied set of oriel windows projects out from the Glasgow School of Arts, designed by Charles Rennie MacIntosh. These two terms are often confused. They are related. 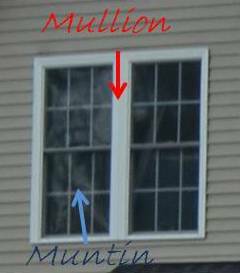 The muntin is the divider between individual panes of glass. A mullion is a divider between windows. In modern windows the muntin is usually between the two panes of a double insulated glass or rests on one side or the other, merely suggesting that the large glass pane is actually many separate panes. Can you add to our definitions? Can you suggest a term we need to add? Help make this dictionary better! Add to our store of knowledge. Add pictures. Suggest words. Your content will appear on a Web page exactly the way you enter it here. You can wrap a word in square brackets to make it appear bold. For example [my story] would show as my story on the Web page containing your story.